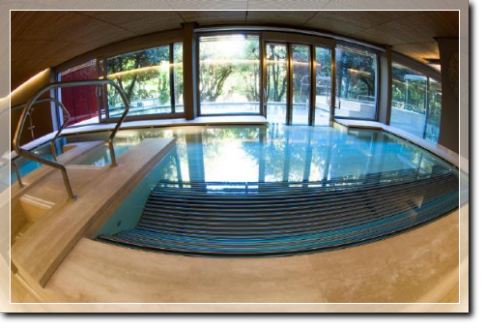 The brand-new Sensory Spa is yet another facility created by the worldwide renowned "Terme di Chianciano". The Sensory Spa is a true Thermal Temple, which integrates state-of-the-art architecture and technology with the most ancient wellness practices and traditions. 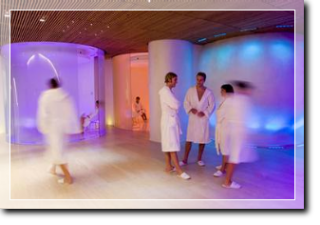 It offers 20 different experiences, divided into 4 specific sensory trails: Depurative, Relaxing, Energizing, Rebalancing. A unique experience to regain the harmony of your senses: swimming pool with whirlpool, saunas, Turkish bath, beauty mud treatments, chromotherapy, aromatherapy, and much more. The dramatic environment of the spa facility was designed in view of the idea that "looks count" and architect Paolo Bodega worked on the creation of spaces where innovative architectural solutions are perfectly blended with the pre-existing ancient thermal springs, which were skillfully restored.Designed by the company that manages the Spa Facilities in Chianciano Terme, the Wellness Center included in the brand-new Sensory Spa specializes in treatments based on the principles of Naturopathy and its five key elements - water, fire, earth, air, ether - play a crucial role in the entire experience. The different trails are designed to meet the clients' each and every need. • The depurative trail is particularly suited to freeing the body and the mind from toxins accumulated in time due to unhealthy diet, inappropriate lifestyle, long periods under medications, and intestinal disorders. • The rebalancing trail is designed to regain the balance of body, mind, and spirit. • The energizing trail is designed for specific problems, such as decrease in one's energy, lowering of immune defenses, states of anxiety, lack of self-confidence, insomnia, psycho-physical exhaustion, panic attacks, and agitation. • The relaxing trail is created for those who suffer from agitation and anxiety, muscle-tension and vasomotor migraines, as well as stress. At Chianciano Terme's Sensory Spa you can enjoy the unique experience of entering the extraordinary energetic pyramid, a true jewel of technology which has the same proportions as those of Cheops's pyramid, where visitors can access a soundproof room and manipulate different types of thermal mud in the melmarium. 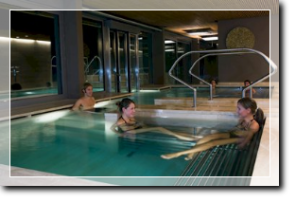 into specific programmes to revitalize your senses and relax your mind. Recommended duration: 10-15 minutes per session; frequency: no more than two sessions. 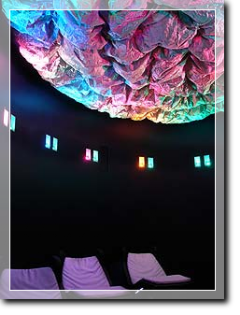 Colour and music therapy room for psychophysical and energy rebalance. Showers with cold and gentle stimulation from 15°-20°-30°C; Benefits: 15°-20°: Stimulates cells and strengthens immune systems; 30°: gentle body cooling after high temperature therapy when cold treatments are not possible. Frequency depending on the individual before or after different baths or tratments. Ice waterfall; ice massages stimulate revascularization giving an enjoyable refreshing feeling after a sauna or hot bath. Spray mist perfumed with mint; Benefits: light vasodilation and vasoconstriction stimulates vascular system.Temperature: 15°C ca. Energy accumulator according to the Cheope pyramid principles. Recommended duration: 10/15 minutes per session; frequency: 2-3 sessions. Recommended duration: 10-15 minutes per session; frequency: 3 sessions. max. Completely silent chamber to evoke the feeling of returning to the womb; benefits: energy and physical rebalance, it treats psychophysical stress, insomnia, anxiety; it encourages personal introspection. Baths with hydromassage chaise-longue, jet benches and slabs, neck jet pillows; Benefits: energizing, purifying and aids drainage systems. Indicated to clear body and mind of all the toxins derived from unhealthy eating habits, life style and a prolonged use of medicines, intestinal dysbiosis etc. It drains and purifies the skin and the entire body. Against anxiety and uneasiness, tension headache, stress. Particularly indicated for those who want to reach physical and psychological well-being and alleviate muscular-skeletal tension. For all problems related to lack of energy, weakening of the immune defence system, uneasiness, lack of confidence, insomnia, physical and psychological perishing, panic attacks or anxiety. This programme rebalances body, soul and mind. only wimsuit. Slippers, bathrobe and all that is needed is made available free of charge. Contraindications: some of the treatments should be avoided during pregnancy and in the presence of certain illnesses. 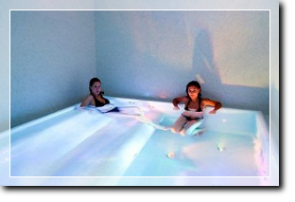 Children under the age of 13 are not allowed to enter the Sensory SPA.